The following is an excerpt from Spare Parts, by Joshua Davis. 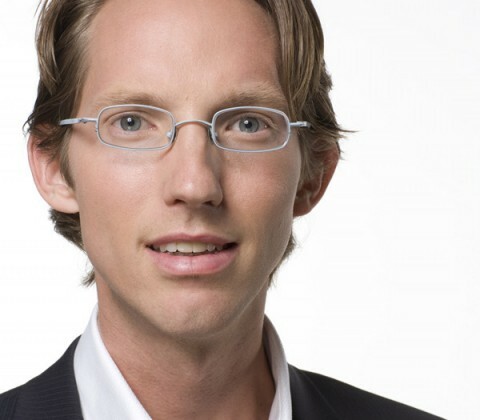 Tom Swean eyed the four teenagers standing nervously at the front of the classroom. The kids were backed by a green chalkboard, and a swarm of desks crowded the space between them and the three judges. Swean was a gruff fifty-eight-year-old who ran the Navy’s Ocean Engineering and Marine Systems program. At the Office of Naval Research he developed million-dollar autonomous, underwater robots for the SEALs. He was not used to dealing with Mexican American kids sporting gold chains, fake diamond rings, and patchy, adolescent mustaches. “How’d you make the laser range-finder work?” Swean growled. It was June 25, 2004—a hazy summer day at the University of California, Santa Barbara—and though the campus was largely empty due to the summer break, South Hall was crowded. It was the third annual Marine Advanced Technology Education Remotely Operated Vehicle Competition, an event sponsored by NASA and the Navy. It was established to encourage and identify the country’s top engineering talent. There were teams from across the country, including students from MIT, who were sponsored by ExxonMobil, the world’s largest publicly traded company. The Latino kids were from Carl Hayden Community High School in West Phoenix. “We used a helium-neon laser,” Cristian Arcega answered rapidly, keyed up on adrenaline. He was a skinny, five-foot-two science ace, one of the few nerds at Carl Hayden, a school where 71.17 percent of students received free or subsidized lunches because they were below the poverty line. Cristian lived in an eight-foot-by-eight-foot plywood box slapped onto the side of a trailer in a mobile-home park. “We captured its readout with a CCD camera and manually corrected by thirty percent to account for the index of refraction,” Cristian explained to the judges. Swean raised a bushy, graying eyebrow. Lisa Spence, the flight lead at NASA’s Neutral Buoyancy Laboratory, sat beside Swean. At NASA, she was in charge of replicating the space station in a 6.2-million-gallon tank at the Johnson Space Center in Houston, Texas. She had been at NASA for seventeen years and had worked with some of the most advanced underwater ROVs (remotely operated vehicles) in the world. Before starting at NASA, she had majored in chemical engineering at Arizona State University in the seventies and knew the area of Phoenix where these kids lived. It wasn’t a positive association. She remembered West Phoenix as a place that she wouldn’t drive through by herself. It was a poor area and the better schools were elsewhere. So she was surprised to see an underwater-robotics team coming out of that neighborhood. “There aren’t oceans in Phoenix,” she pointed out diplomatically. Spence couldn’t help but smile a little. Many of the teams had arrived at the competition with extraordinary underwater machines. They were made of machined metal, and some teams had bud gets of more than ten thousand dollars. These kids had shown up with a garishly painted plastic robot that was partially assembled from scrap parts. They called their creation Stinky because it smelled so bad when they glued it together. It was their first time participating in any kind of underwater-robotics competition, but they had entered the highest division, going up against a field thick with veteran college teams. To some, their presence here seemed like a mistake. But Lorenzo was clearly proud of the contraption. To him, it was a major accomplishment. He was fifteen years old and wore the back of his hair long so it fell past his shoulders. Kids in his neighborhood referred to it as the Mexican mullet. He’d been a member of the WBP gang before joining the robotics team, and he tried to walk with a tough guy’s swagger. In reality, he was desperately trying to build a life outside the troubled world he’d grown up in. Swean followed up with a question on signal interference, and Lorenzo looked at Oscar Vazquez, the team’s de facto leader. Oscar was seventeen years old and sported the crew cut of an Army Ranger. For four years, he had distinguished himself as part of Carl Hayden’s Junior Reserve Officer Training Corps, eventually becoming the group’s executive officer. The previous year, the corps designated him Officer of the Year, the unit’s highest honor. He dreamed of being a soldier, and it had looked as if he had a bright future in the military. But it turned out the Army didn’t want him. He had lived in Phoenix for six years and thought of himself as an American, even though he’d been born in Mexico. His parents had snuck him into Arizona when he was twelve. No matter how many push-ups he did or how fast he ran, he couldn’t outpace the fact that he was a fugitive, living in the country illegally, and therefore barred from enlisting. When he realized this during his senior year, he went looking for another field in which to distinguish himself. “You’re very comfortable with the metric system,” Swean observed. “I grew up in Mexico, sir,” Oscar said. Swean nodded. He didn’t care where the kids were from as long as they were smart. He eyed their rudimentary flip chart. Spence knew that teams sometimes had an Einstein, Jr., a single kid who knew all the answers. Cristian clearly qualified, but Lorenzo and Oscar had also been able to speak intelligently about their robot’s mechanical and electronic components. It was meant to be a team effort, so the judges took into account whether all team members could answer questions. Their robot had to successfully complete a complex series of underwater tasks, but about half the competition score would be based on this technical evaluation. Spence looked at Luis Aranda, a six-foot, 250-pound hulk of a kid who looked like Chief from One Flew Over the Cuckoo’s Nest. He hadn’t said anything yet. Oscar, Cristian, and Lorenzo glanced at Luis. Throughout high school, he’d worked nights as a short-order cook at a diner and often seemed half-asleep during the day. They’d recruited him onto the team in part because they needed someone strong enough to lift the robot in and out of the pool. He rarely said much of anything, so it was hard to tell what he was thinking. Cristian wanted to answer for him but held back. Cristian couldn’t believe it: the answer was spot-on. He wanted to hug the big guy. Spence nodded. She would never have guessed that a downtrodden West Phoenix high school would have produced such an assured group of underwater roboticists. As a NASA employee, she had become accustomed to working with engineers who conformed to a sort of industry standard: white, well educated, conservative clothes. These four teenagers standing in front of her signaled that the future looked different. 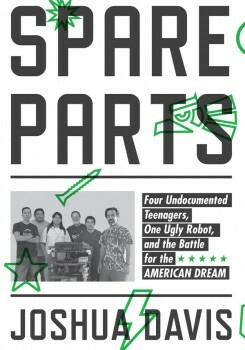 Excerpted from SPARE PARTS: Four Undocumented Teenagers, One Ugly Robot, and the Battle for the American Dream, by Joshua Davis, published in December 2014 by Farrar, Straus and Giroux, LLC. Copyright © 2014 by Joshua Davis. All rights reserved. Joshua Davis is author of Spare Parts: Four Undocumented Teenagers, One Ugly Robot, and the Battle for the American Dream (FSG Originals, 2014), contributing editor at WIRED, and co-founder of Epic Magazine in San Francisco, California. In "Spare Parts," four teenage MacGyvers beat MIT with a smelly robot built with PVC pipe.